"To provide free public education on environmental, peace, and social justice issues"
We are almost ready to reopen at our new location at 4862 Voltaire Street, which is right across the street from our old location. We are working on setting up our library this Saturday, March 2nd at 1:00 pm if anyone would like to help. 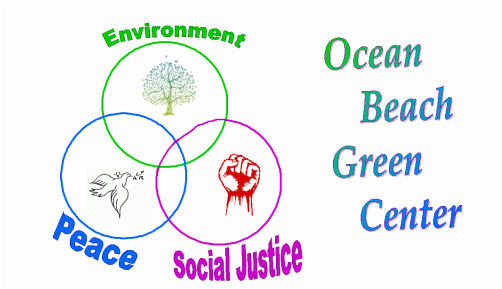 We will post our opening date sometime this month on our website: oceanbeachgreencenter.org. Thanks for your patience and support. The Ocean Beach Green Center (originally known as The Green Store) is a small, independently run resource center that has been in existence since Earth Day 1989. We have operated for 29 years by utilizing our personal resources and with the support of family, friends, and others devoted to the cause of the environment and social justice movement. To provide information to the public on environmental, animal rights, peace and social justice issues so they can become better educated and become involved. To encourage people to support the organizations actively involved in these causes by donating their time and/or money. To provide networking opportunities for individuals and organizations; an open forum for all to come together to work on solutions for the wide-range of problems/issues facing our world. To provide information on earth friendly and socially responsible businesses/products so we may become responsible consumers. The Ocean Beach Green Center doesn't claim to have all the answers. We are all trying to learn from each other how to live in this world peacefully and with as little impact to the planet as possible. Thousands of caring and concerned people have walked through our doors in the last 29 years and we have benefited greatly from the sharing of their knowledge and hopes. Won't you join our conversation?